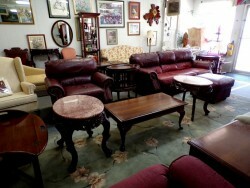 Dorn's Used Furniture offers name brand furniture at low prices. Ethan Allen, Thomasville, Pennsylvania House, Drexel, Broyhill, and La-Z-Boy are some of the top furniture brands you’ll find here. We specialize in American-made vintage and antique furniture and home decor. With two buildings full of furniture; as well as lamps, pictures, glassware, china, and figurines, you are sure to find decor to fit your personal style!